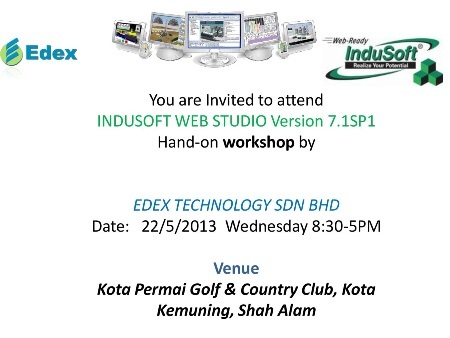 Edex Technology – Indusoft SCADA V 7.1 workshop May 22. Indusoft SCADA Workshop organised by Edex Technology will be held on 22nd of May 2013. This workshop is specially designed for the existing customer of Edex Technology who would like to explore the capability of Indusoft V 7.1 and further enhance their business in this Area. • Introduction to Indusoft and their software, Indusoft Web Studio. • Project settings, Web Access, Mobile Access.